The view from the summit of Ama Dablam is said to be incomparable – a 360 degree vista edged all around by the cloud wreathed peaks of the Himalayas. Defining the edges of the horizon are the giants, Mt. Everest and Lhotse and there too is Nuptse and Pumori, the mountain known as ‘Everest’s daughter.’ When Mihin Amarasinghe finally found himself standing on the summit of Ama Dablam at 3 p.m. on October 27, 2011 he simply stood there drinking it all in as precious minutes slipped by. Posing for pictures, he raised his ice axe triumphantly, one sharp tip aligned with the summit of Mt. Everest, clearly visible in the distance. Ten minutes later the 31-year-old was on his way down – the first Sri Lankan to ever summit an expedition peak in the Nepalese section of the Himalayas. The mountain he scaled is as exquisite as it is challenging. Like many others before him, Mihin’s first sight of it came when he was on his way to Everest basecamp. Dominating the horizon for days, its name was pure poetry: Ama for the long tapering ‘arms’ and sturdy ‘torso’, so like that of a mother’s embrace and Dablam for the resemblance of its hanging glacier to the traditional double-pendant worn by Sherpa women. It stands alone in Solu Khumbu valley, towering over the famous Sherpa villages of Thyangboche and Pangboche. At 6, 812m, Ama Dablam is not as tall as Everest or K2, but its cold, high oxygen starved slopes have claimed their fair share of mountaineers. Others, intimidated by the threat of frostbite or hostile weather, have turned their backs on the summit. More crucially, it is an expedition peak and not to be taken lightly – it’s revealing that summit records are only kept for the latter. “I chose to climb Ama Dablam because it is a beautiful mountain…and also because it is generally regarded as a highly technical Himalayan test piece, and one of the finest climbs of its type in the world,” notes Mihin, explaining that there is no ‘easy’ route to the summit. It takes a dedicated, experienced alpinist capable of alternating between high altitude trekking and scaling sheer precipices of snow, rock and ice. Sections that would present a modest challenge at sea level are altogether different beasts at 6,000m and above when the cold air sears your lungs and the weight of your equipment seems to double. The challenge Ama Dablam presented seems to be what caught Mihin’s interest. Having graduated with a degree in mechanical engineering from the University of Manchester, Mihin was an active member of the Manchester University Mountaineering Club (MUMC) and went on to serve as a reservist in the British Army for six years. Through the latter he earned several Military Adventurous Training Instructor (ATI) Qualifications, leading AT expeditions across the UK and Europe. Returning to Sri Lanka, he founded Lanka Adventure, an outbound training outfit that works primarily with corporates. In fact, his company sponsored the trip and the expedition’s official title was Lanka Adventure Ama Dablam Expedition 2011. In the days before his determined summit run, Mihin flew into the Tenzing-Hillary airport – and found its reputation as one of the most dangerous airports in the world promptly confirmed when he and some others were roped into manoeuvring a crashed plane off the steep runaway. The town of Lukla itself is something of a gateway for mountaineers attempting to scale the likes of Everest. Trekking out from there on the 14th of October, they began their journey to the basecamp of Ama Dablam. Not having yet had a chance to acclimatise, Mihin expected to spend the coming days gradually giving his body a chance to cope with the oxygen depletion in the higher altitudes. Consequently, they trekked up to the Camp 1 and back down and would have done the same with Camp 2 had not the threat of an oncoming storm intruded. Mihin and his Sherpa companion decided to abandon their original plan, choosing instead to push on to camp 2 and then to 3 and finally to the summit. Between camps 1 and 2 lay a walk along a horizontal rock ridge and the Yellow Tower, a steep rock precipice that had to be scaled. The scenery here was its own reward – with the ground falling away dramatically on both sides of the ridge, one had a panoramic view of the snow cloaked Himalayas all around. Ama Dablam’s Camp 2 is famous – perched precariously on what looks like a rocky outcrop, it offers just enough room for five tents to sit cheek by jowl. A glimpse over the edge is enough to debilitate anyone with even a hint of vertigo, as the mountain simply seems to fall away. They headed out at 10 p.m. the next day – a late start by any standards. “In the last stretch you’re climbing the South Face, basically,” says Mihin, adding, it’s “straight up.” It’s difficult to gauge the distance left even if you crane your neck and it’s only by tracking the convergence of the edges of the mountain that you know how close you’re getting. When you finally pull yourself over the ledge, as if to compensate you for what it’s put you through, the mountain rewards you with a summit large enough to relax on and a view to die for. After savouring their victory for an incredibly brief few minutes, the two men headed down at once. Before the week was out, Mihin was back on a plane to Sri Lanka, having missed by hours a storm so severe that it shut down the Lukla airport for a week. 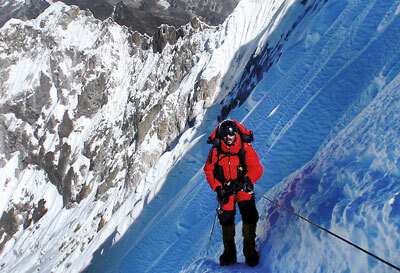 Grinning now, Mihin admits that that was a bit of luck – something every mountaineer, no matter how skilled, could use. He’s hoping it will keep him company on his next climb in 2012. He has his eyes on Manaslu – the ‘Mountain of Spirit’ in Nepal sends it jagged peaks punching 8,156 metres into the air and is the eighth tallest mountain in the world. Will he attempt Mt.Everest? He shrugs and says it’s a possibility, but for now, Mihin is content to take it one mountain at a time. 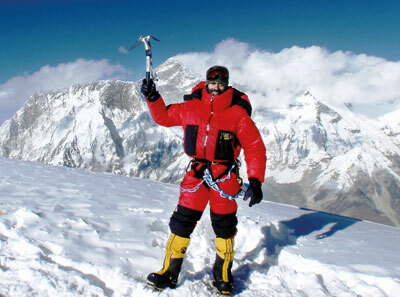 Tags: Mihin Amarasinghe becomes the first Sri Lankan to climb an expedition peak in the Himalayas. Bookmark the permalink.